10 years after its launch, Tata Motors has said the world's cheapest car will be phased out by the end of this year. It might look like just another piece of jugaad (okay, maybe a tad better) on the road now, but 10 years ago, the Tata Nano had hit the ground running. The car of a million dreams — the world’s cheapest at a dealer price of Rs 1 lakh. Unveiled at the 9th Auto Expo in New Delhi in 2008, the Nano was aimed at India's budget-minded middle class — a tiny four-seater in striking red and yellow colours with an engine of around 625cc. The Rs 1 lakh (ex-showroom) price was almost half the cost of the cheapest car at the time — the quintessential Maruti 800. Ten years later, in 2018, Tata Motors has announced the Nano will be phased out by the end of the year. 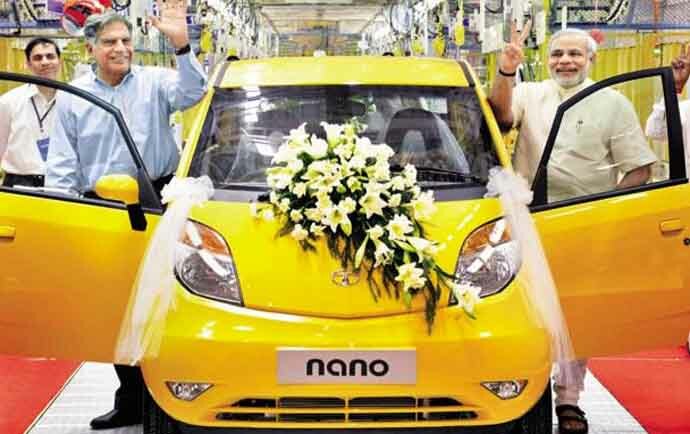 The launch of Tata Nano on January 10, 2008, saw hundreds of thousands of people crowding Pragati Maidan — the Auto Expo venue — to see the “miracle of a Rs 1 lakh car". Some even stood on chairs to get the best view as chairman Ratan Tata drove the car onto the stage. “Let me assure you and our critics, the car we have designed will meet all safety norms and all foreign environmental criteria,” Ratan Tata said as he proudly unveiled the "people's car". The arrival of Nano had literally driven everyone crazy. The morning after, newspapers went berserk with headlines like "From No-No to Nano" and "Nano Mein Sapna". News agency Reuters described the launch as "a media circus more worthy of a pop concert or an Oscar ceremony". While owning a car was (and still is) a dream for most Indians, especially the lower-middle class, Nano had given them a chance to follow that dream. The scooter-towing "aam aadmi" was tired of lugging his wife and children, often with additional luggage. For the "freewheeling-on-two-wheeler" families, the Maruti 800 was not quite affordable. So, when Tata Motors in 2003 promised to give Indians the cheapest car, everybody lapped up Ratan Tata's dream project. At its commercial launch in March 2009, the company chairman said, "The Nano represents the spirit of breaking conventional barriers." From April that year, the automaker started accepting pre-orders (through a lottery/booking slip form) for the world's cheapest car. In the first week itself, Tata announced it had sold over 81,000 booking forms. By May first week, it proudly announced 203,000 fully paid bookings. But unlike the buyers, environmentalists were not so enthusiastic, especially because of the fear of millions of Nanos flooding the already congested roads, sending emissions levels higher. Ten years may not be a long time for the Indian middle class to go for a car-change, but enough to make them understand the downside of owning a Tata Nano. With demand for the car slumping, the automaker finally acknowledged that Nano in its "present form cannot continue beyond 2019". According to this news report, "Tata produced one unit in June, down from 275 in the same month last year. Exports were zero, versus 25 in June 2017." Tata Nano coming to a screeching halt has at least made one thing clear — while everybody wants to own a car at the most reasonable price possible, nobody wants a "cheap" car — a car that becomes a liability. Auto experts opine that "cutting costs to the bone in pursuit of sales is no use if the end result has reliability issues". There were several let-downs that the eagerly-awaiting Nano enthusiasts soon found out about. The base model, although initially advertised as a Rs 1 lakh car, actually cost around Rs 1.4 lakh. Moreover, to cut down on costs, the base model had no AC, no power steering. Added to that a rear hatch which wouldn't open, making it difficult to access for loading. This is not what the middle class had dreamt of. People wanted a car for comfort, not as a status symbol (which the Nano, with its "slightly upgraded-autorickshaw look" could anyway not provide). But this car both looked ugly and felt claustrophobic. There was worse in store for Nano owners. The "dream car" had a tendency to catch fire — sometimes on its very first drive out of the storeroom. Sample this news report from 2010: "Satish Sawant, an insurance agent in Mumbai, collected his brand new Nano from a showroom at 3pm and headed home, dreaming of showing off his first car to his family at LIC Colony, Mulund (West). At 3:45 pm, the car burst into flames at the Eastern Express Highway. Sawant jumped to safety. Sawant had spent Rs 2.4 lakh on the silver Nano (MH03 AW 913), which he had got fitted with an A/C and a power steering." Nobody knew what led the brand new car to burst into flames just 45 minutes after it had left the showroom. And that's when the safety issues started to show — heat leading to shortcircuits, faulty sparkplugs, fuel leaks, etc. "In the Nano, you have to slide the backseat and open the bolts to access the rear engine in an emergency. This takes time. In other cars, the engine can be accessed by opening the bonnet to douse the fire," the same news report quoted Rajinder Jassal, who has considerable experience in the automobile electronics business, as saying. Some others pointed out that people going overboard with "amplifiers and woofers" were increasing the risk of adding "load on batteries, causing a short circuit". 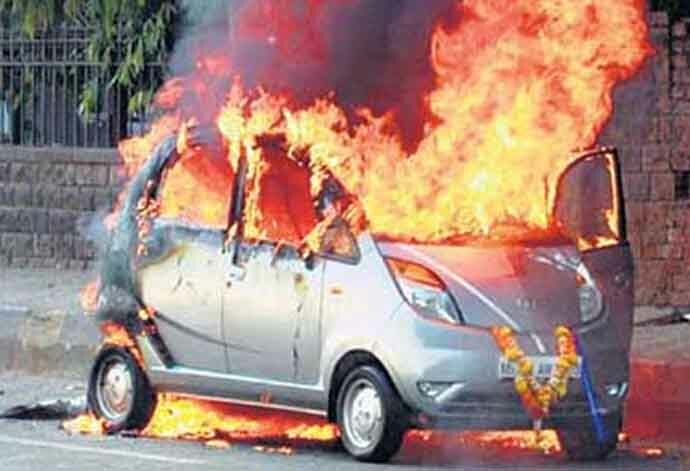 From a project that literally made Singur in West Bengal singe — Nano cars were initially scheduled to roll out of a factory in Singur, but ran into a controversy over forced acquisition of farmland — to a car that would burst into flames in the middle of the road, middle class India will remember the Tata Nano as more than just a bad dream.